Ubuntu Linux 8.10, aka Intrepid Ibex, is the most popular Linux distribution available for installing on your PC, thanks to its steadily improving hardware compatibility and installation software, along with a wealth of free applications and utilities that run on any version of Linux. But even though the bad old days of disappointing Linux installations are mostly over, putting Ubuntu on your PC can still be tricky if you haven't done it before. Many PC users have never had to boot their computers from a CD or had to partition a hard disk. And most of us take for granted that the OS will include drivers to handle crucial hardware devices such as graphics cards and wireless networking controllers. For would-be Linux adopters, these and other system configuration complexities are make-or-break issues. Fortunately, most potential hassles are easy to overcome with a little know-how. A few--including the secret to enabling the dazzling Compiz Fusion 3D window manager--reveal the advanced features and customizability that set Linux apart from Windows and Mac OS X. Though it is impractical to try to offer a solution to every conceivable installation snafu in a single article, we will tackle some of the most common problems that plague newcomers and veteran Ubuntu installers. If, during your installation, you run across a problem that isn't covered in this tutorial, head over to the Ubuntu Forums, where a massive community of Ubuntu users is always ready and willing to help out a motivated newbie. Just bear in mind that the Linux community rewards users who make the effort to find the answers themselves. If you take a moment to search for solutions on your own before demanding that others give you the answers, you'll find that more-experienced users will be very cordial and helpful when you truly get stuck. Editor's Note: Much like Ubuntu itself (and Linux in general) this guide has been created and improved in part by feedback and input from experienced Linux users. We are grateful for the insightful contributions of the community, and we welcome new ideas to help us improve and expand this Ubuntu installation guide. If you have new information that you believe would make this guide more helpful to first-time Ubuntu users, please let us know in our comments section. We will update this guide regularly as Ubuntu Linux continues to evolve. Select a mirror site near your location to use for downloading the Ubuntu CD image to your desktop. Be warned: It's nearly 700MB in size. 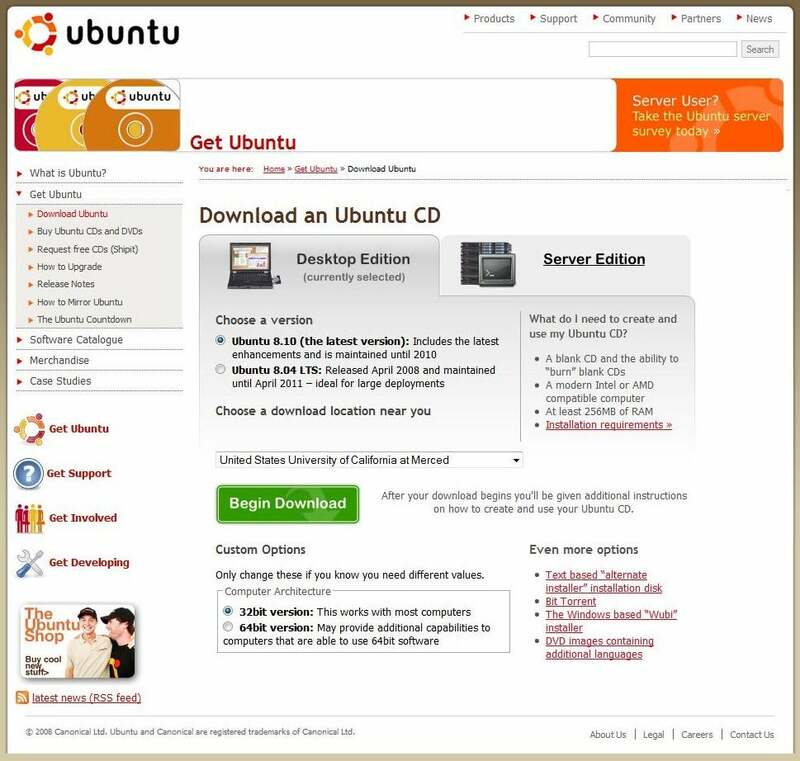 The most common way to install Ubuntu is to download and burn a copy of the free installation CD. If you still live with a dial-up connection, you may be better off buying an installation DVD from a distributor such as Amazon or arranging to have a free copy mailed to you from Canonical (be prepared to wait six to ten weeks for it to arrive). The 700MB download takes only minutes to complete over a cable modem connection; if your transfer time is slower, don't be afraid to stop the download and select a different mirror site from the list. But what do you do with the resulting ISO disc-image file? Neither Windows XP nor Windows Vista knows how to burn .iso files, but Alex Feinman's free ISO Recorder does the job. After installing the version of ISO Recorder that's compatible with your version of Windows, right-click the downloaded Ubuntu ISO file and choose Copy image to CD. Alternatively, you can copy the Ubuntu install CD to a sufficiently large USB flash drive, using the techniques described in the Ubuntu documentation Web site.